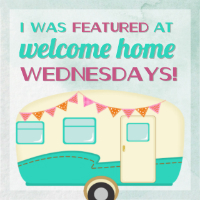 Welcome to Welcome Home Wednesdays number 41! Last week’s party was AMAZING! We had over 360 links ups…Ya’ll have been busy! 🙂 Thanks so much for helping our party grow! Since this was our biggest party yet, we’re going to keep it going…check our social media accounts throughout the week for even more features!! Like any good hosts we’re sitting right by the present table waiting until our guests leave so we can go through the loot… the loot being your links! We can’t wait to check out what you’ve left for us. Trust me there will be a lot of pinning, tweeting and facebook sharing going on in the near future… we can’t wait to show off what you’ve left! Sign up for the newsletter and get access to all the freebies!